This sweet and savoury chicken stew recipe can be made a day in advance and re-heated for when you are ready to tuck in. Melt the butter in a large casserole dish over a medium heat. Add the shallots and fry for 8-10 minutes, stirring occasionally, until softened and lightly caramelised. Add the carrots and cook for 5 minutes more. Add the chicken thighs, garlic, bay leaves, cinnamon, pomegranate juice and molasses, and the stock. Bring to the boil, then turn down the heat to a gentle simmer. Cook for 45-50 minutes until the chicken is cooked through and tender. Season with salt and pepper, stir in the herbs and top with pomegranate seeds. Serve with steamed rice. 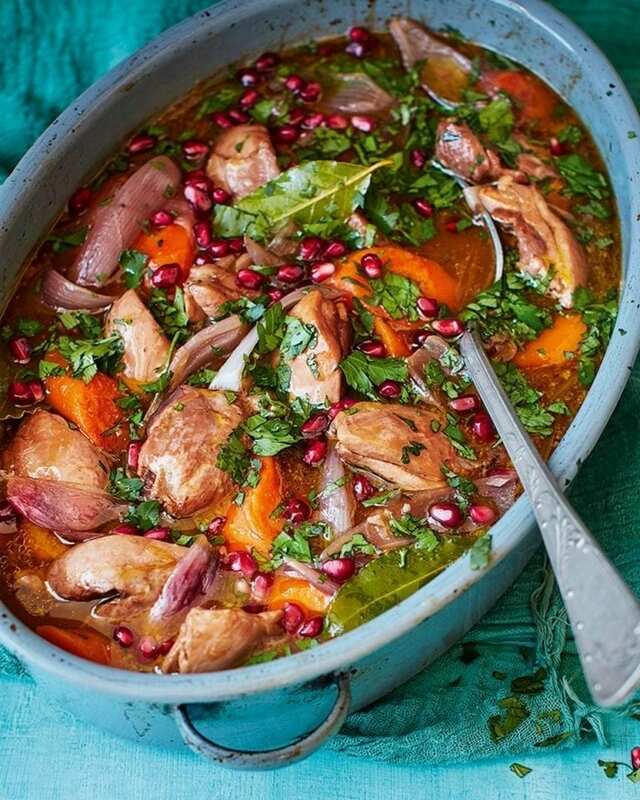 Make the stew up to 24 hours ahead (without the herbs and pomegranate seeds), then keep, covered, in the fridge. Heat until piping hot throughout, then add the herbs and seeds.